It just got easier for veterans and active members of the military to refinance their VA loans. The VA streamline refinance, also known as an interest rate reduction loan (IRRRL), is one of the best ways for active and former military members to lower their monthly mortgage expenses. The VA streamline refinance is one of the easiest loans to qualify for, offering flexible income and income verification requirements. 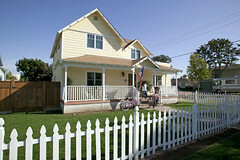 Refinancing with a VA streamline means veterans are able to easily take advantage of today’s record low mortgage rates. This refinance is called a “streamline” because the documentation and underwriting requirements to complete the loan are simplified. This gets service men and women to the closing table quickly, and allows them to enjoy their lower mortgage rate as soon as possible. Everyone with a VA loan should contact a Home Loan Expert to find out how much they could lower their mortgage rate and mortgage payment with the VA streamline program. Refinance your VA loan with Quicken Loans and enjoy a reduced funding fee! It just keeps getting better!